We’re not talking Jimmy Choos or even Birkin bags (although I wouldn’t turn down either one), no I’m talking about diamonds. Let’s face it, ice is nice and that’s what the latest Louis Vuitton Haute Joaillerie collection is offering to your average couture customer (which I must stress is definitely not moi). In this bold collection Vuitton pays tribute to the techniques of the past and age-old cut of stones combined with a contemporary aesthetic. While all of the pieces are simply breathtaking, I adore the Monogram flowers in diamond lace. The Peter Pan collar harkens back to the Victorian era and is supple and delicate. 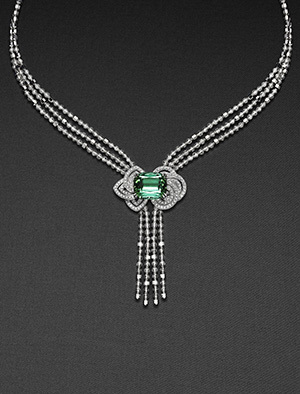 Invisible threads set with rose or brilliant cut antique diamonds converge on a front clasp. 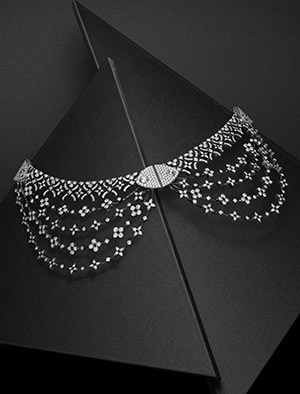 This collar would nicely dress up any little black dress or sweater hanging in your closet – just saying. Wendy's Best Friends: Peter Pan, Louis Vuitton, and Diamonds. If plain diamonds are just too boring check out Vuitton’s Fleurs D’Eternite necklace. Showcased in a setting based on flower knots, there are strands of faceted white gold beads intertwined with diamond beads that cascade over the skin. Interlacing diamonds outline sculptural Monogram flowers with round or pointed petals that surround a gorgeous hunk of green, indicolite or Paraiba tourmaline. Don’t need another necklace, then check out the matching earrings and ring. Personally I love bracelets and there’s a killer one in the collection. Fashioned in white gold, it features guilloche enamel in red spinels and pink sapphires outlining the brand’s signature LV monogram motif against a diamond mosaic ground. Just another way to show off those ubiquitous initials! I could go on and on since the collection includes gorgeous rings, (my size is six and a half in case you’re interested), a necklace that converts into two bracelets (for the thrifty shopper) and lots more to dazzle you. So dream on, diamonds are a girls best friend!